Today I finished developing the new Exact App Center (EAC) and put everything live at http://www.exact.nl/appcenter. The EAC is an app center just as Facebook, Google and Apple use, with the only difference that it there is no actual store, but it has a lead generating focus. The EAC is a catalogue which displays all the extensions for existing Exact products like Exact Globe Next, Exact Synergy, Exact Online, etc… Extensions, also known as apps, are built internally by Exact or by third parties. As you can imagine there are many apps available for the Exact products. 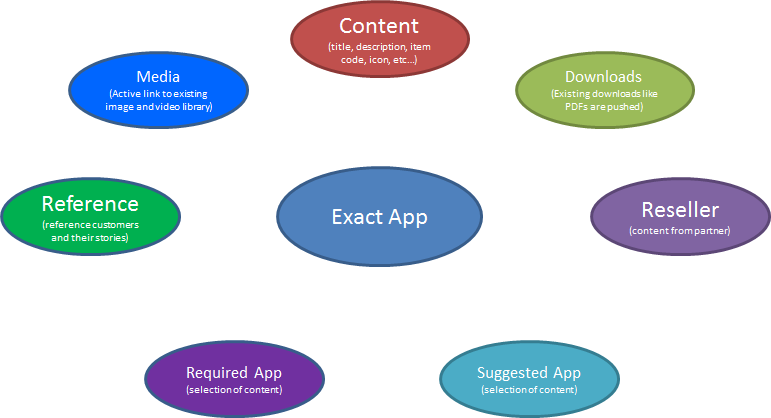 Figure: an Exact app consists of various already existing “pieces of content”, these are added on-the-fly when an Exact app webpage is shown. As shown in the figure the EAC uses a lot of existing content from different parts of the Exact websites. Luckily a lot of content on the site is structured by using a content construction kit (CCK). By using a CCK you can create standard website templates based on list of fields which content editors can complete. The CCK makes sure that all the information entered by the content editor is displayed in a proper layout. As you can see, all these pages have one thing in common, their layout is fixed and based on the values of the list of fields, which the content editors complete, the webpages are rendered by the CCK. Besides rendering the webpages the CCK also automatically builds category lists and a homepage, all based on the structured content. That’s not all the CCK does, in the figure above you can see that the Exact App card also re-uses content from other cards. By doing so the EAC becomes a hub for the various cards. Also the other entities (cards) are hubs in themselves, thus building a truly interconnected web, great for SEO and great for people to navigate. The more relevant connections there are between parts of the site and other sites, the stronger a sites becomes. Probably this all sounds a bit theoretical, but let me give you a live world example. In the EAC there is an app, let’s call it Synergizer, which allows you to use Exact Synergy faster. To use this app Exact suggests to use a couple of different apps as well and one other app is required. You can imagine, that this is the first step in content linking and re-using. Now imagine that Synergizer is being sold through partner T-Caxe. This reseller information is also bundled into the EAC card automatically and also a link to the external site of the reseller is created. Suppose there are also three customers who act as references, that information is also integrated into that same EAC card. Download of a PDF that Exact has on file? Video’s, images? Same story! Comments and ratings from web site visitors? It all get bundled into one single EAC card with links to other cards, entities and websites. First of all, a big thank you goes out to all the colleagues I worked with to achieve this. And let’s not forget the fine people from YOOTheme who created ZOO, in my eyes the number one CCK for Joomla. By the way, if you are interested in all the cool stuff we do at Exact in building websites, you can also read some info here, here and here! Or drop me a line.